launch Picasa when you plug in your camera. Our native Firefox integration also makes it easy to download entire albums from Picasa Web Albums with just a click. 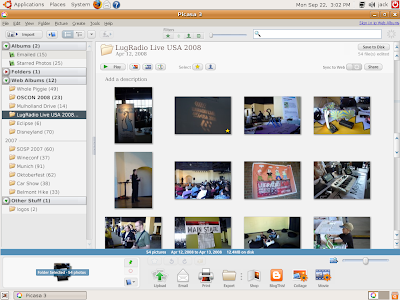 The most important features from our Windows release are all present in this beta of Picasa 3 for Linux: Along with faster performance, Picasa 3 for Linux introduces new features like automatic web sync, a greatly-improved collage tool, a powerful retouching tool, and an intuitive text tool that's both fun and useful. A full list of changes can be viewed here. To get started, visit our download page. You can also use the Google Linux Software Repository to install and stay up-to-date with all of Google's Linux software. If you have questions after installing, please visit our Linux-specific FAQ or Linux User Group. And, for those who have been keeping score, we've contributed about 850 patches to Wine so far this year, bringing our total to about 2700. Many of this year's patches have been to improve video support (courtesy of star intern Maarten Lankhorst), but those changes are not yet finished, so the Movie Maker feature and movie support in general is still disabled. To learn more about Google's participation in Wine, see our blog post from earlier this year or our Wine contributions page on code.google.com. Thanks to the Wine Project for a fabulous tool! Want to discuss this blog? Visit Our Google Help Forum.